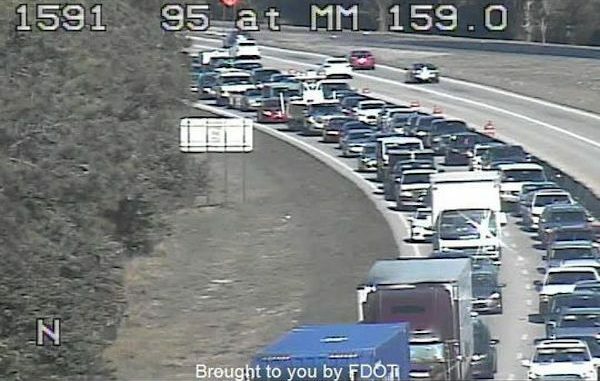 VERO BEACH – All southbound lanes on Insterstate 95 has been shut down between the Vero Beach and County Road 512 exits after a crash that involved multiple vehicles. Two people are dead after a tractor-trailer overturned during a crash that involved two cars. The accident happened about 5:30 a.m. about a mile north of State Road 60. Traffic continues to back up for several miles north of C.R. 512 near Fellsmere and S.R. 60. The Florida Highway Patrol told Sebastian Daily that all lanes are expected to reopen by 12:00 p.m. One person was pronounced dead at the scene. Another crash victim was transported to Longwood Regional Hospital, where they died. A third person was transported to Vero Beach Regional Hospital and are expected to be recover from their injuries. The FHP is still investigating the crash. Story still developing. Check back for updates.